Commission The Lycan Knight by Karl A. Nordman. Bring Your RPG Character to Life. 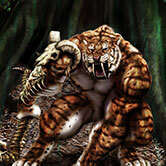 Play the game in style with cutting edge, realistic Character Portraits by: The Lycan Knight. Do you have an Epic RPG Character? Give them the 5 Star treatment! character avatar can be a real downer. It's not tall enough, or has the wrong armor. I get it, I feel your pain. So why don't you do something about it? Isn't your character worth it? I bet you said YES! Immortalize Your Character And Bring Them To Life! What I Got Is Magic! Click Play on the Video below and Prepare to be IMPRESSED! Single Full Color Character Portrait (Non-Magical Weapons Included. No Background.) Additional Items Are Extra Per/Character. 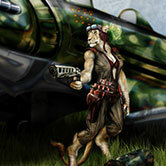 Single Full Color Character Portrait on a Detailed Background Setting. (Non- Magical Weapons Included.) Additional Items Are Extra Per/Character. 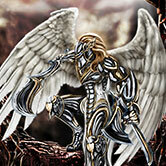 Single Full Color Character Portrait -Magical Effects- on a Detailed Background Setting. (Non-Magical Weapons Included. )Additional Items Are Extra Per/Character. -Two- Full Color Main Characters on a Detailed Background Setting. Pets/Steeds- Etc. Are Extra Per/Character. -Two- Full Color Main Characters - Magical Effects- on a Detailed Background Setting. Pets/Steeds- Etc. Are Extra Per/Character. Group Shot -3 Or More- Full Color Main Characters on a Detailed Background Setting. -Magical Effects- Pets/Steeds- Etc. Are Extra Per/Character. Single Full Color -Weapon/Magical Item- Illustration. WOW That Is Great ART I Want Some! Step By Step, I'm With You All The Way! Request your free quote from me and get your Lycan Knight Commission in motion. I will email you the quote for the Commission Request. If you accept, The Commission begins! States what you can expect from me, and what I can expect from you. Fair and Square. I work up the pose and make (usually 3 different) roughs of the character for you to decide which concept design looks best to you. The Character rough you wanted is now in full production. I'll send progressions for you to approve as we go. The Character is all drawn up, the stage is set and the finer details are put into place. As before, I'll send progressions for you to approve as we go. Here is where the art all comes together. Color is added, magical effects are created and the finishing touch is applied. If all went well the art is done, the final size is made and the Art is delivered to the inbox of your choosing. the final 50% of the Commission comes due to be paid. Check out My Frequently Asked Questions! Whatever they may be. This is just a small example, but I think you get the picture. And that isn't all. I can do various settings as well. Have something not listed? Hit any of the green commission request buttons and feel free to ask me about it. Macabre and old style with gothic theme of horror and all things creepy. 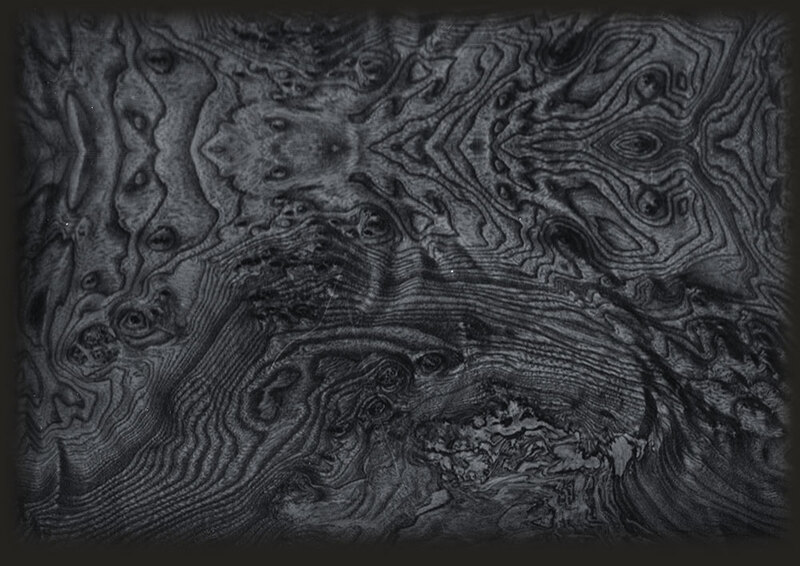 Otherworldly with the paranormal, with things that go "bump" in the night. Mysterious underworlds filled with Dark fantasy. Magic, spells and illusions. Supernatural worlds full of ,angelic, and demonic symbols and splendor. Parallel universes like Steampunk, Lord of the Rings, WoW, GoT and many others. Epic style settings all filled with style, action drama and/or flair! After your visit to my worlds and experience the Lycan Knight commission you will certainly be drawn into my imagination. Beware, once you glimpse the worlds behind my eyes you may never want to come back. To answer the question, that my friends is: Whatever your creative art needs are, it is a great probability I can fulfill your artistic needs with a creative style and professionalism you can count on. I invite you contact me just to find out how deep the rabbit hole of my artistic ability goes because my imagination is just bursting with creativity. Who knows what artistic masterpiece we can create when we combine my endless creative skills with your vision! The possibilities are nearly limitless. What makes a Lycan Knight Commission so special? With so many scams in our world today I want to assure you that I will not take your $ and never call you back. I stand on principal and as a true professional I will personally see to it that you get the best quality customer service. I work with you from step one all the way through to completion of YOUR Commission to reach the results You demand for the perfect piece of art YOU requested. After your Commission experience with the Lycan Knight you will certainly get the best quality and service that will make your Lycan Knight Commission a thrilling experience that is ultimately rewarding. What can I expect after I request a Commission? Once you have agreed to the Free quote and some of the preliminary details are worked out, I will ask that we comply to an Art Commission Agreement before I begin creating your art. This agreement will state the type of work being done, the payment, payment schedule, the usage rights you will be granted upon delivery of the finished work, and a few other miscellany. This document is to protect both you and me and ensure that we both get what we agreed upon. I will require 50% of the total payment before I begin the work, but you are welcome to pay the whole amount up front if you wish. How do I request a Lycan Knight Commission? Please click any of the Large GREEN buttons above or below and you will be prompted to send me an email with your request for a Commission. Please include your contact information so I can get back to you quickly. Thank you. Is there anything you won't draw for me? Political, Religious, Crude, or Sexual in Nature to name a few. Any Commission request that I might find in bad taste, otherwise offensive or in copyright violation will be respectfully declined. When In doubt please ask. What do you charge for a Commission? The price of a Commission will vary depending on the requirements for the image(s) requested. I take into account the size and complexity of the image, as well as the usage rights that are requested. I'll send you an official quote via email along with items or information that I will require from you to fulfil the Commission as requested. What Guarantee do I have you're the best choice for my commission? *If you are dissatisfied with your character portrait after I have tried to correct the issues you are displeased with, then you get all your money back. Yep, EVERY LAST CENT. However, you also surrender the art back to me. After all, you took your money back, you don't get to keep all my hard work for nothing. It is only fair. All art, including comps, drafts, and anything related to the Commission that I have created in its entirety, may not be used in any form by you if the Commission is rendered void by either you or myself. The Time Is Right, You Know You Want To. 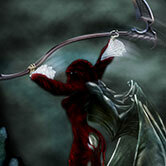 Check out what people just like you are saying about their Lycan Knight Commission! Working with Karl was awesome and fun! If any of you are looking for someone to bring your character to life, Karl is the one to talk to! Already working on a second project! Took me long enough but this is another commission I had done by Karl A. Nordman a while ago. I absolutely love how it turned out. I still highly recommend him for anyone who wants their character, not only illustrated, but embodied into an image that is so thoughtfully drawn out and made to your every specification. He also helped me really develop my character personally along the way. His work is most certainly worth the price and he is a great pleasure to work with. That is an awesome red panda. I like the details in his outfit, especially the folds in his robe. And the face is pretty expressive. The scrolls have a life of their own, too. I love it ! Run with it! Santa, His Sleigh and 8 / Tiny Reindeer. Gosh that looks great. I magnified it some and there is a lot of magic detail you put in. You do have a magic wand for things. 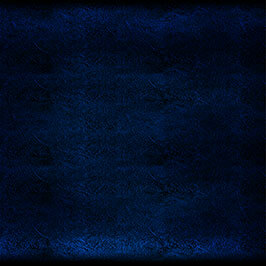 It is wonderful - now one has to decided is some enough or do you go further and enhance more. I don't want to make that decision and I think you have done just enough to add that little bit of more detail and magic all in one treatment. GOOD STUFF, I am giddy just looking at it. I commissioned you a long time ago for an RP character. I have always been in love with the picture you did and even after year of no longer playing that character I keep going back to the art. Karl Nordman says in his bio that he creates new worlds under his brush and unleashes dreams. In my case, he brought to life a long cherished character from my dream-world better than I ever thought possible. Karl was a pleasure to work with, very responsive to my requests, adding his creativity to my thoughts through a series of preliminary pictures to ensure that I was pleased throughout the process. Turnaround time was excellent and the quality is topnotch. I highly recommend him as both an artist and businessman and well worth more than the low prices he charges. You won't be disappointed. Lets Recap Just To Set It All Straight! Join in on the Artistic Sensation. Get Yourself The Lycan Knight Commission Today! Reward Yourself, You Know You Need It! Want More? Visit My Online Gallery! Art by The Lycan Knight on some very cool gear! 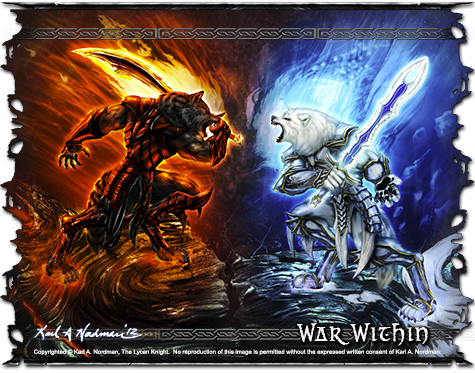 Gaming Mats Featuring The Art of The Lycan Knight. 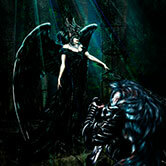 T-shirts and Collectibles, Featuring The Art of The Lycan Knight. 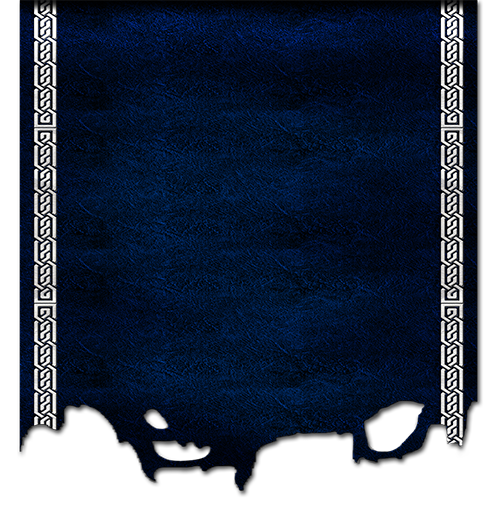 All art displayed within are © Karl Nordman,The Lycan Knight. All rights reserved!